Pebble’s recent Kickstarter campaign for the Pebble Time 2, Pebble 2 and Pebble Core was record-setting, bringing in over US$11 million. The only Pebble model left without a reason to celebrate was the Pebble Time Round, but not anymore. Pebble is introducing a few, high-end options to its Pebble Time Round lineup. Right now, you can pledge for a new polished gold or silver style. Each black-bezeled wearable will ship this autumn and include a 20mm black leather band and are priced at US$199, just above the steel-cased models that have recently dropped to US$149. 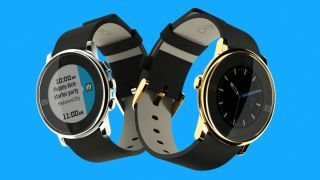 These limited edition Pebble Time Round options are high in fashion, but low in quantity. So, if you’re looking to get one of the most fab-looking Pebble’s around, check out the Kickstarter. In February, Pebble Time owners on AT&T gained a special power in the form of iOS voice-to-text functionality. And starting today, T-Mobile users can now take advantage of the smart feature, too. Not just that, Pebblers who reside in the UK, Australia, or the Netherlands, can also start chatting with their wearables. Adding onto the ability to reply to an SMS or iMessage with your voice, you can also hit back with emoji or a customized text response if you’re in a spot when you aren’t in the position to speak up. Sure, Android owners have long been able to use voice input to handle such a task, but Pebble’s Time has slowly, but surely morphed into the most capable smartwatch, aside from the Apple Watch, available to iPhone users.